1955 (February 15) - Twelve members of what would become the Peninsula Hellenic American Association agreed to formally create an organization to promote greater interest for the welfare of the people of Hellenic descent and to organize themselves for the betterment of the educational and religious needs of their group. 1956 (September 14) - The first Divine Liturgy celebrated by the new church community in honor of the Feast of the Exaltation of the Holy Cross. Father Stanley Marcantonis celebrated the Divine Liturgy at the I.O.O.F. Hall in San Mateo. Photo: Father Zachary Xintaras celebrating the first Divine Liturgy on the Belmont property. 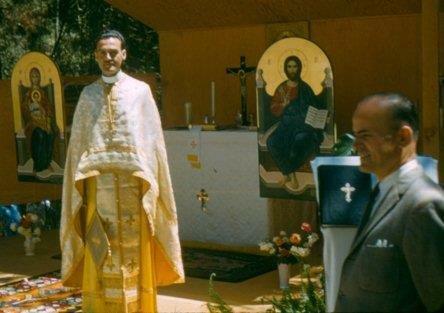 1959 (July 5) - The first Divine Liturgy on the newly acquired Belmont property was conducted in a temporary structure in the parking lot by Father Zachary Xintaras who was assigned to serve the parish in 1958. 1964 - The church buildings were constructed. Father Steven Katsaris was the parish priest from 1962 to 1970 and oversaw the construction and dedication of the church building. 1970 - Parishioner George Liviakis proposed the idea of hosting a large-scale Panegyri festival, patterned after large feast day celebrations in Crete and mainland Greece. The first Holy Cross Greek Festival was held in 1970 at the San Mateo Country Fairgrounds. 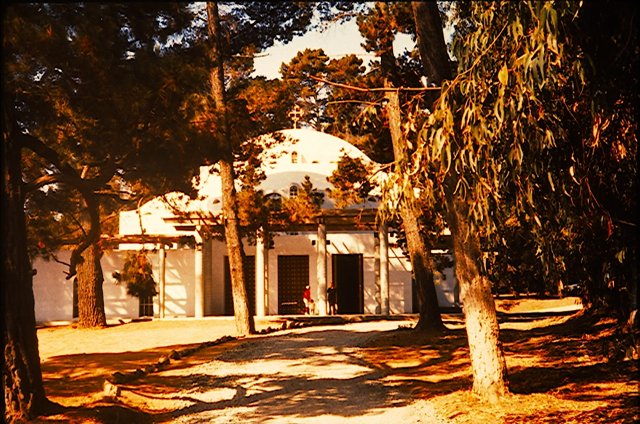 1979 - The classroom complex and community center were completed. 1979 (October) -The Very Reverend Leonidas Contos took the reigns from Father George Stevenson as parish priest and led the Church of the Holy Cross through nine years of growth and change. 1983 (September) - Archbishop Iakovos, assisted by His Grace Bishop Anthony, Father Contos and Bay Area clergy, consecrates the church by placing in the altar the relics of Saint Nicholas of Myra, Saints Cosmas and Damianos, and Saint Panteleimon. 1988 (August) - The Reverend Father Peter Salmas became the parish priest. 1993 (October 9) - The dedication ceremony for new buildings: The Oaks, expanded kitchen, and administration building. 1997 - The Holy Cross Preschool was established to develop and maintain an environment for positive learning experiences which will encourage children to grow socially, emotionally, physically, and cognitively within an Orthodox Christian context. 2004 (February) - Initial phases of mosaic iconography were installed by the master iconographer, Sirio Tonelli. This included the dome and pendentive arches. 2006 (September) - The Church of The Holy Cross was gifted a sacred relic of the Holy Cross from The Theophileon Brotherhood of the Skete of Saint Anna of the Great Lavra on Mount Athos. The Relic was brought to the church by the Very Reverend Archimandrite Cherubim Apostolou, Abbot of the Skete of Saint Anna.